Possible Duplicate: Is Java pass by reference? System.out.print(obj.getName()); // This prints "anotherName"
I know that Java pass by value, but why does it pass obj by reference in previous example and change it? Java always passes arguments by value, NOT by reference. 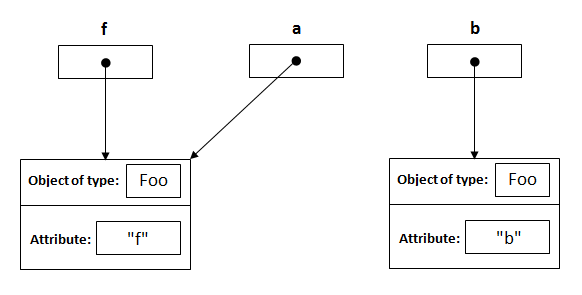 In your example, you are still passing obj by its value, not the reference itself. Inside your method changeName, you are assigning another (local) reference, obj, to the same object you passed it as an argument. Once you modify that reference, you are modifying the original reference, obj, which is passed as an argument. modifyReference(f); // It will change the object that the reference refers to! 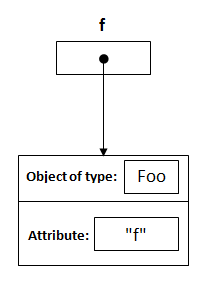 1- Declaring a reference named f of type Foo and assign it to a new object of type Foo with an attribute "f". 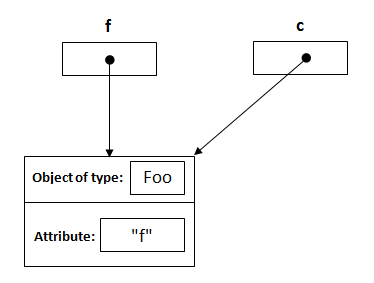 2- From the method side, a reference of type Foo with a name a is declared and it's initially assigned to null. 3- As you call the method changeReference, the reference a will be assigned to the object which is passed as an argument. 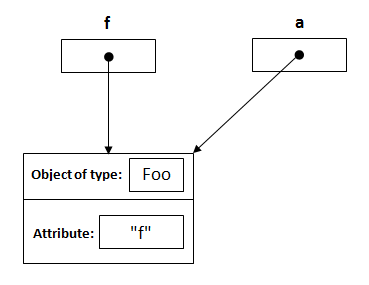 4- Declaring a reference named b of type Foo and assign it to a new object of type Foo with an attribute "b". 5- a = b is re-assigning the reference a NOT f to the object whose its attribute is "b". 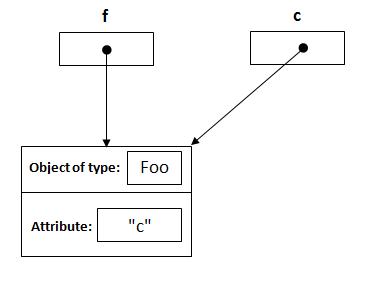 6- As you call modifyReference(Foo c) method, a reference c is created and assigned to the object with attribute "f". 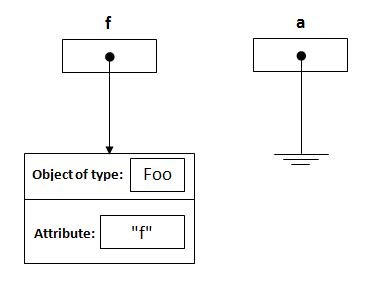 7- c.setAttribute("c"); will change the attribute of the object that reference c points to it, and it's same object that reference f points to it. 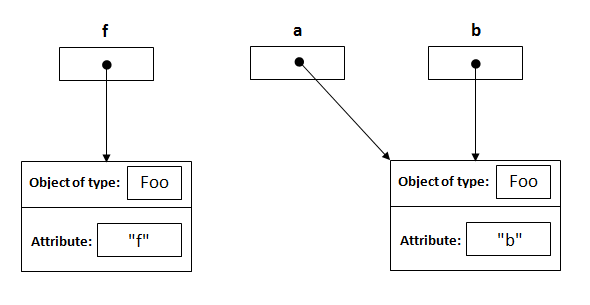 In Java, an object handle, or the identity of an object is considered a value. Passing by value means passing this handle, not a full copy of the object. A "reference" in the term "pass by reference" also doesn't mean "reference to an object". It means "reference to a variable" – a named "bucket" in a function definition (or, rather, a call frame) that can store a value. Passing by reference would mean the called method could change variable values in the calling method. (For example, in the C standard library, the function scanf works this way.) This isn't possible in Java. You can always change the properties of an object – they aren't considered a part of its "value". They're completely different independent objects. You're changing a property of obj, not changing obj (the parameter) itself. The point is that if you pointed obj at something else in changeName that that change would not be reflected in main. See this post for further clarification. And have "anotherName" printed by the main method. Java is passing a copy of what you're passing to your function. When it is a primitive type - it will be the copy of a value. When it is an object - you're passing the reference copy. In you're code example you're modifying one of objects properties, but not the reference itself so the name will be changed. However when you'd like to assign new object to obj variable in changeName function, then you're changing reference, so outside obj will have an old value. It is passing the reference to obj as a value (a bit confusing I know :)). So let's say it makes a copy of the pointer to obj's value and pass that. is still going to refer to the old object (the one that you did setName). Not the answer you're looking for? Browse other questions tagged java parameter-passing terminology pass-by-reference pass-by-value or ask your own question. What exactly does “pass by reference” mean? If java is passed-by-value why my object changes after executing the method?